I will next year again serve as a TPC member for the ICC 2016 CoCoNet workshop. Find the call for papers here: here. This entry was posted in Colourcast, Network coding on November 19, 2015 by mortenvp. This year at the AAU Network Coding Summerschool I gave a lecture about fifi-python which is Python bindings to the Fifi library. The Fifi library enables fast finite field computations in the most common binary extension fields, which are at the core of most Erasure Correcting Codes (including Network Codes). This entry was posted in Colourcast on August 22, 2015 by mortenvp. This summer (July 20 – August 7) we ran our mobile phone programming summer-school for students from around the world. This year we had 13 participants for the mobile phone programming track. During the three weeks the students get intensive crash course on mobile application development (this year the focus was on Android). Besides becoming familiar with various aspects of mobile programming the students also develop their own mobile applications. Typically this is great fun – and if you are interested in learning more about the upcoming AAU summer-schools or the mobile phone programming track, you can visit the AAU summer-school webpage here. 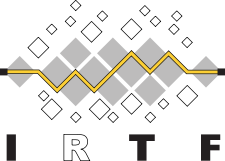 This week the IETF 93 is being held in Prague, Czech Republic and along side it several of the IRTF research groups are also meeting. I will a small update on our survey of Sliding Window Network Codes at the Network Coding Research Group (NWCRG) on the second day (Tuesday July. 21). You can find the agenda here. This entry was posted in Colourcast, Network coding on July 20, 2015 by mortenvp. 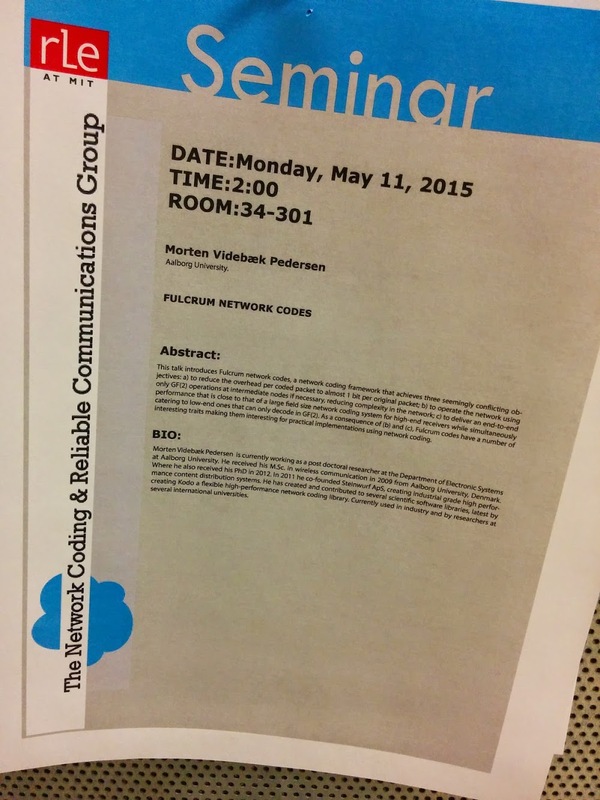 This coming Monday (May 11, 2015) at 2:00PM I will be giving at talk at MIT on our work on Fulcrum Network Codes. This talk introduces Fulcrum network codes, a network coding framework that achieves three seemingly conflicting objectives: a) to reduce the overhead per coded packet to almost 1 bit per original packet; b) to operate the network using only GF(2) operations at intermediate nodes if necessary, reducing complexity in the network; c) to deliver an end-to-end performance that is close to that of a large field size network coding system for high-end receivers while simultaneously catering to low-end ones that can only decode in GF(2). As a consequence of (b) and (c), Fulcrum codes have a number of interesting traits making them interesting for practical implementations using network coding. This entry was posted in Colourcast, Network coding on May 9, 2015 by mortenvp. This week the IETF 92 is being held in Dallas U.S. and along side it several of the IRTF research groups are also meeting. I will presenting our work on Sliding Window Network Codes at the Network Coding Research Group (NWCRG) on the last day (Friday March. 27). You can find the agenda here. This entry was posted in Colourcast, Network coding on March 23, 2015 by mortenvp. Since its introduction at the turn of the millennium, network coding has evolved from a simple idea to a mature interdisciplinary filed, with a solid body of knowledge generated by a diverse group of researchers. Over the years, network coding techniques have had significant impacts and benefits in throughput, reliability, security, and energy efficiency. We believe that in the next fifteen years the field will expand even further into new multidisciplinary area and provide a fertile ground for the next generation of researchers, leading to new breakthroughs, discoveries, and solutions to long standing open problems. The goal of this workshop is to discuss the long-term horizons of the field and identify key areas and research problems that will be in the focus of the research community. The workshop will include speakers from a broad spectrum of backgrounds, from theoreticians to practitioners, and from the founders of the field to younger faculty and students.